Annie Lennox provided the soundtrack to many of my growing-up years - the good, the bad, the regrettable, all there was to love, survive, celebrate. My choice for runway music is Annie Lennox's "Ghost in My Machine." It is a song about pain. I can't listen to it, however, without feeling a surge of life, strength, resiliency. Pain is what we stand on to strut our stuff! It provides a surface on which to stomp, a springboard from which to leap. The song, for me, is a giant "in your face" to the hardships we face. I'm caught up by the ghosts in my machine"
I love old steam engines. The mechanisms that power them: the parts & pieces, all that iron & muscle is inspiring. Some might call me a scavenger. I prefer the term, "Dumpster Diving Diva." Here is some trash I've been collecting for this project. Some of it I've washed & dried like it is fine china. My husband has gotten used to finding trash in our dishwasher. Pieces of sheer curtain, plastic strapping may be good options for expressing qualities of ghosts & machines. I love all the random shapes of plastic packaging. Also pictured are the filters from K-cups, lids from craft markers. 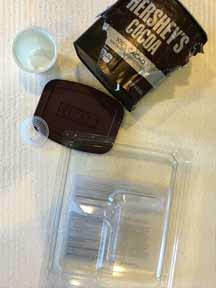 Hershey's Cocoa lids are a find because they are square & rare. Also, the strange plastic shapes in this snack container will be useful as a part of a "machine."